Browse: Home / Stalls as social enrichment?! When the pig codes were being reviewed and updated by the National Farm Animal Care Council, we urged the industry to adopt a requirement for pen enrichment in multiple areas: social, so the pigs could interact and play with one another; nutritional, so pigs could explore and chew on straw or hay to give them a feeling of fullness (rather than the chronic hunger many experience); and sensory, so pigs were provided with items like toys they could explore and manipulate. 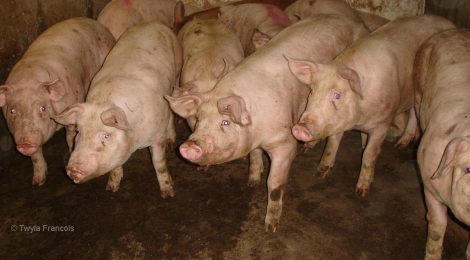 We also urged that the requirements follow those already in existence in Europe which mandate that enrichments be swapped out for new items every few months as pigs are extremely inquisitive and quickly become bored. This is one of the many problems with “outcome-based” objectives. It becomes a race to the bottom on exactly how those objectives will be met. Who needs straw and objects the pigs can manipulate when stalls count as social enrichment and turning on a radio fulfills sensory enrichment?